Can Mubarak’s Cronies Buy Their Way Out of Jail? Egypt’s reconciliation process has been lauded as restoring confidence to outside investors. But others say it amounts to impunity for the rich. On March 28, Egypt’s former trade minister, Rachid Mohamed Rachid, was removed from an arrest list after he paid back a total of 15 million Egyptian pounds (approximately $2.2 million) to the state as part of a reconciliation program under President Mohamed Morsi. Rachid, who served as minister from 2004 to 2011, fled just before the toppling of former president Hosni Mubarak and was tried in absentia for profiteering and squandering public funds during his time in office. He was sentenced to twenty years in prison and fined over 1.4 billion Egyptian pounds (approximately $202 million). The deal struck between Rachid and the Morsi government came amid accelerated efforts by Egyptian authorities to reach out-of-court settlements with former regime officials and businessmen accused of corruption and cronyism. “We will reconcile through a legal process with anyone who did not corrupt or was somewhat corrupt but did not spill blood,” Hatem Saleh, the current trade minister said in January. The sale of state assets, mainly land for housing and tourism developments, to crony businessmen at prices below market value became a hallmark of the Mubarak regime, particularly during its last decade in power. In the wake of Mubarak’s ouster, cases were brought against numerous businessmen and regime officials. But in January 2012, just days before Egypt’s newly elected parliament was to hold its opening session, the military council that ruled in the interim period issued a decree amending an existing investment law to allow charges to be dropped if the accused paid back their illicit gains. In an attempt to reinvigorate the process, this year the Muslim Brotherhood–led cabinet voted to allow defense lawyers to plea bargain for clients convicted in absentia. But critics of the program say the reconciliation process lacks transparency, does little to tackle corruption and undermines the promise of change at the very heart of the revolution. “The black curtain has been drawn again, and behind it they say they are doing reconciliation,” says Khaled Ali, a lawyer and former presidential candidate who led several prominent anti-corruption cases under Mubarak and who first shed light on the little-noticed decree amending the investment law in a newspaper column last year. Indeed, the reconciliation process lacks a clear framework and there is no public role in defining who is eligible for negotiations. Official announcements come only after settlements have already been finalized. “You are not doing reconciliation. What you are doing is a cover up of corruption because the first lesson of the war on corruption is transparency,” Ali says. The name most often associated with the reconciliation program is Hassan Malek, a longtime member of the Brotherhood and one of its most prominent and wealthiest businessmen. While he has no official government role, Malek has acted as President Morsi’s chief liaison with the business community, heading the presidential committee Tawasol—“outreach” in Arabic—to open channels of communication with accused businessmen who have fled the country. Malek also heads the EBDA, although Vice President Farid denies that he or any other organization outside of government has any authority to run negotiations. “Unfortunately, there are a lot of rumors,” he says. “Tawasol, EBDA and so forth have the power only to encourage the business community to go into reconciliation.” Farid declined to comment on the process of returning illegally acquired funds in exchange for having charges dropped. The parameters governing the reconciliation process are vague. Accused investors are required to pay the difference in price between what they paid for an asset and its actual market price at the time. But critics point out that it remains unclear whether any fine is levied or if any accounting is done of profits during the period since the asset was acquired at below-market value. Ali’s sentiment is echoed by Transparency International, which monitors corporate and political corruption worldwide. The organization downgraded Egypt in its 2012 Corruption Perceptions Index, dropping it six places to 118 of 176 countries. Wilcke’s critique followed the lifting of a travel ban on ten Mubarak regime officials after they repaid the value of gifts they were said to have received from the country’s leading state-run newspaper, Al-Ahram. Implicated in the case were Mubarak himself, as well as former prime minister Ahmed Nazif, and former Shura Council speaker Safwat El-Sherif. In a separate, high-profile case, the public prosecutor is currently considering a settlement request by fugitive business tycoon Hussein Salem, one of Egypt’s wealthiest businessmen and a close associate of Mubarak, who fled to Spain during the 2011 uprising. Salem offered 75 percent of his assets inside Egypt and 55 percent of his wealth abroad in exchange for the government dropping all corruption charges against him. In March 2012, Salem was handed a fifteen-year sentence in absentia for illegally acquiring public property. He was also sentenced to fifteen years in jail in June 2012 for squandering public funds in a controversial gas deal with Israel before the Cassation Court ordered a retrial in March. According to the privately owned daily Al-Shorouk, Salem’s lawyer puts his total wealth at approximately 10 billion Egyptian pounds (approximately $1.4 billion). Some 450,000 farmers are struggling with financial problems in settling their debts with the state-owned Development and Agricultural Bank, according to the Land Center for Human Rights. Predatory lending practices have left farmers with debts at usurious rates of interest and debts many times the original loan. There is criticism of the government’s handling of the reconciliation process from the business community as well. Though its members generally view it as essential to boost investor confidence in Egypt, particularly in the face of a plunge in foreign currency reserves and rising inflation, some are concerned it is insufficient. A month later, Egyptian authorities slapped a travel ban on the two men on charges of tax evasion. They were both outside of the country at the time but faced arrest on their return. The government accused OCI of owing more than 14 billion Egyptian pounds (approximately $2.1 billion) in unpaid taxes from a 2007 deal to sell its concrete-manufacturing subsidiary to the French company Lafarge for 66.4 billion Egyptian pounds ($9.6 billion)—the largest ever in the history of the stock exchange. On April 30, OCI reached a settlement with Egyptian authorities and agreed to pay 7.1 billion Egyptian pounds (approximately $1 billion) in ten installments over a four-year period. In a statement, the company maintained it had done nothing wrong and continued to believe it had not broken any tax laws but did not want to face “a prolonged legal battle with unpredictable outcomes.” The travel ban on Sawiris and his father was lifted yet many economic analysts have warned the OCI tax dispute sent the opposite signal to prospective investors that the government’s reconciliation efforts are intended to foster. 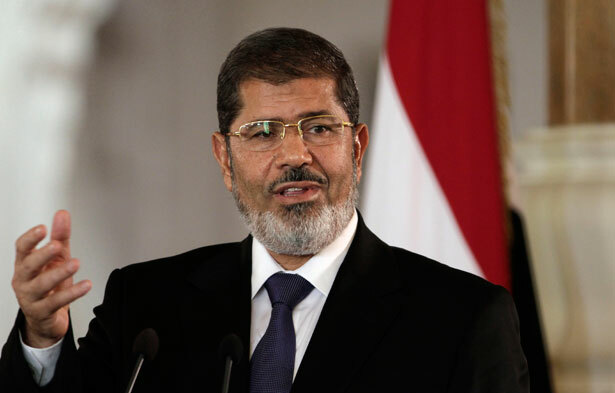 Nevertheless, the reconciliation negotiations with companies, businessmen and former regime officials continuing behind closed doors as Morsi and the Muslim Brotherhood face unabated political turbulence and unrest throughout the country. Why did the FBI put Assata Shakur on its Most Wanted list? Read Mychal Denzel Smith’s take.